Today sees the fifth anniversary of the launch of the UK Web Focus blog which took place on 1 November 2006. A year after the launch I provided a review of The First Year Of The UK Web Focus Blog and on 1 November 2009 reviewed The Third Anniversary of the UK Web Focus Blog. A year later I published a post on the Fourth Anniversary of this Blog – Feedback Invited. In those reflective posts I asked in 2008 whether “on reflecting on the various feedback I’ve received, it seems to me that I’ll need to give some thought to perhaps creating a new blog” – in the end, although I contributed to several project and event-focussed blogs, I published posts primarily on this blog. In 2009 I commented that “with over 600 posts published on the UK Web Focus blog, I can’t recall all of the things I have written about!“. The following year I described h0w “the blog [is] my open notebook [used] to keep a record of activities I had been involved in and my observations and thoughts on developments“. This year I’ll again provide a snapshot of the statistics for the blog. There have been 988 posts published and 4,610 comments (which, I should add, includes referrer links). There have been 377,300+ views, with an average of 205 views per day over the five years. The busiest day was 14 January 2011 when there were 1,420 views following the publication of a post on Institutional Use of Twitter by Russell Group Universities. The numbers of daily views peaked in 2009 with an average of 247 views per day. Last year there were 243 views per day and so far in 2011 there have been 230 views per day. This slight decrease reflects the number of posts published, with 263 posts published in 2009, 200 in 2010 and 137 to date in 2011. In terms of the average numbers of views per post in 2009 there were 342 views per post, 443 in 2010 and 508 to date in 2011. In addition to these usage statistics I’d also like to analyse the Web sites which drove traffic to this blog. As can be seen from the accompanying image showing details of the referrer traffic (captured over a week ago) the Twitter Web site was the most significant driver of traffic (having provided 8,0291 views up to today – 28 October 2011) , sending more than twice as much traffic than Google Reader, which was in second place with 3,792 views. After the UKOLN Web site (2,672 views ) there were then some further Web-based RSS readers (Netvibes and Bloglines with 2,356 and 2,300 views) followed by the Google search page (2,058 views) and then an individual’s blog provided by Stephen Downes which delivered 1,292 views followed by Facebook with 1,112 views and another aggregated collection of visits generated by Google search which delivered 1,006 views. These were the only services which have delivered over 1,000 views. In total the top nine referring Web sites delivered 24,617 views. This is, however, a very small proportion of the 376,700+ total number of views (~6.5%). How else have people arrived at the blog if not by the Twitter Web site, Google, RSS readers and other popular blogs and Web sites? The answer could be that there is a long tail of referring Web sites. Unfortunately WordPress does not provide a total for referrer statistics. However after copying the data into Excel I find that there are 499 referring Web sites which deliver a total of 45,804 visits, with the last seven entries each delivering five visits. I am assuming that there WordPress either displays a maximum 0f 500 entries or has a cut-off of five visits. But based on the statistics which are available it seems that Web sites referrers only deliver ~12.2% of the traffic. In order to understand how the missing 78% of the traffic arrived at the Web site I’ve looked at traffic for a particular post. Looking at the statistics for the recent post on Are University Web Sites in Decline? it seems that there were 297 views of the blog on the day the post was published, but there were only 102 referrers from Web sites. 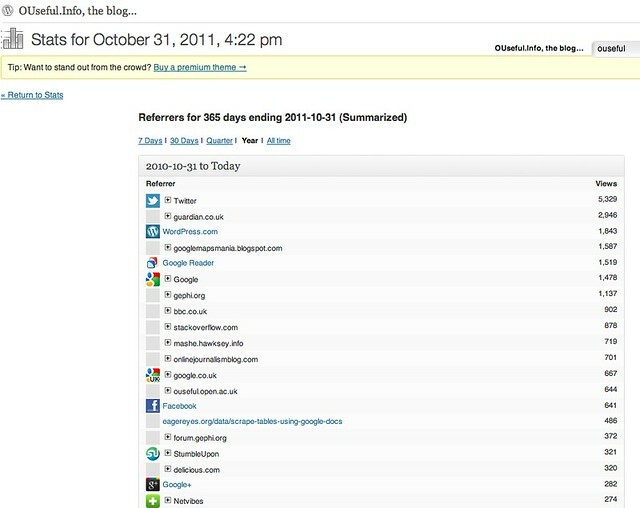 Looking at the bit.ly statistics for the post it seems that there were 36 clicks on this link on the day of publication and 32 on the following day, with only 11% of those views coming from the Twitter Web site. However over 50% of the views are still unaccounted for. Some of these will probably be from email subscribers of the blog; there are 95 subscribers who use the Feedburner email service with 32 subscribers viewing the post on 20 October. And the remainder? I suspect they’ll be other Twitter users who have followed a URL provided by a link shortening services besides bit.ly. Using another example, as described above the busiest day for this was 14 January 2011 when there were 1,420 views following the publication of a post on Institutional Use of Twitter by Russell Group Universities. Looking at the bit.ly statistics for this post we can see that there were 798 of the shortened link on the day the short link was published on Twitter. The WordPress statistics for the post show that there were 1,088 views of the post on the blog on the day of publication. The conclusion I have reached: most people now view posts on this blog following alerts they have come across on Twitter rather than via a Google search or by subscribing to the blog’s RSS feed. Or, to put it more succinctly, social search is beating Google and RSS. Is this really the case or have I misinterpreted the data? And if the data is accurate for my blog is this trend being replicated across other blogs? I’d be very interested to hear from other blog authors on how traffic is arriving at their blog. Tony Hirst has kindly provided a screenshot of referring traffic to his OUseful blog for the past year which shows that Twitter Web site is also, by a significant margin, the most popular referrer site. Any other bloggers have findings they are willing to share? My much neglected blog doesn’t get much traffic, but any spikes in traffic have been down to tweeps with a lot of followers RTing my promotional tweets. Personally, I’ve found that social media has made RSS largely redundant for my current awareness purposes. Below are the top referrers to my blog from 26,000 hits in 2010 and 19,000 hits in 2011. By way of explanation for the top referrer, In the past I have posted a few “10 interesting websites…” posts, which received relatively large numbers of hits, many of which came from charlierb3 which specialises in listing blog posts with that sort of title. Hits from makeuseof result from some comments I posted on one of it’s extremely popular posts about search engines and the invisible web. All sorts of things can skew the stats – i.e. if you feed your posts into Facebook, this will result in more referrals from Facebook. My blog consists of information-related, and also personal, posts. I arrive here semi-regularly via a browser bookmark – not referred at all. No doubt I’m in a deep minority, but maybe we shouldn’t completely rule out that some people still navigate the web directly. Thanks for this post – interesting stuff. I suspect we’ll a similar pattern with CETIS blogs – ie traffic being driven by twitter (we have an aggregated google analytics ). Will try and have a look and get back to you. Something we should follow up in terms of ISC communications in general anyway. @Brian Not sure I agree with you… my stats from the last year show a lot of Twitter referrals, but also (following a three or four day experiment by WordPress a week or so ago), inflated referrals from “WordPress.com”. The experiment (or error?) that WordPress ran was to include RSS counts in the stats. The ‘normal’ stats are page views on wordpress.com; the views over the feed can be found by looking at the stats for each page. Good info from Tony, above. And some will result from briankelly or other Twitterers tweeting about specific UK Web Focus posts. These are slightly different types of referrals, or at least are referrals for slightly different reasons. Having a Share facility on the blog will also, obviously, result in more referrals (to and) from Twitter. My own Share thing disappeared for a while. No idea why. It’s not default. @Tony, @Roddy Thanks for the stats you’ve provided and thanks for the more detailed interpretations you have provided. @Tony, I was somewhat confused by the referrer stats from the WordPress.com site. I had thought that RSS feeds were included in the (Web-based) RSS reader referrers, but perhaps they are included in the WordPress.com stats? Anyway, as you suggest, there does seem to be a lack of consistency in the aggregated information provided in the WordPress stats.As you point out you do get RSS info for individual posts. Post: Are University Web Sites in Decline? So perhaps we might speculate that the RSS views is fairly static but the onsite views many vary significantly, depending on Twitter traffic. This, of course, ignores the additional ways in which people read posts, including email delivery, bowser bookmarks, etc mentioned my @Roddy and @Wendell. I hope others, such as @Sheila, will be able to build on my initial speculations and be able to provide a more meaningful summary of changing patterns for accessing blogs. It’s pretty clear to me that Twitter is currently the top way to refer people to web content you think they might be interested in. Most of my comment has already been made; I follow using NetNewsWire and the RSS feed, and rarely click through, except to leave comments. You have mentioned above that your RSS views are usually around the 100+ mark; integrate that across the years and you might get a lot of the missing views, surely? On my own blog, the big daily peaks have come on the rare occasions when I have promoted a post on a relevant email list; roughly triples normal daily hits. You have 2.6K followers, so I guess tweets _should_ give a reasonable number of hits across. However, perhaps this depends on the proprtion of those followers who are “real”, rather than the crop of autofollows and random SEO promoters that I tend to see most of the time (and block). You wouldn’t expect cross-linking to the blog from them. Thanks for the comment. Anecdotally I hear that people are no longer keeping up-to-date with posts in their RSS readers, and I know this is also true for me. I had therefore expected RSS views to be significantly down. However this may not necessarily be the case, and I was being confused by the limitations in the way WordPress provides its RSS statistics. Note that I too occasionally block obvious Twitter spammers who follow me. Note that further to the comparisons of Twitter and RSS traffic, for yesterday’s post on Signals From Sheffield I didn’t tweet a link when the post was published, as I was busy. There were 15 onsite and 125 syndicated views of the post on the day it was published. The post was tweeted yesterday and, as can be seen from the bit.ly information, there have been 107 clicks on the link since the tweet was posted (and subsequently retweeted by three others). As illustrated there have been 205 onsite and 17 syndicated views with a total of 222 views on Tuesday 8 November 2011, according to the WordPress statistical summary for the post. Note that the dark blue represents the onsite views; you can click the image for an enlarged view. It therefore seems that RSS continues to provide a significant number of views (the current average daily number of views for 2011 is 228). However posts which are tweeted can attract above average numbers of views. I appreciate that this ignores people who may be alerted by email, etc. but I felt it would be useful to provide some evidence.